Which paddock stand are people using. After getting some bobbins for the new SX I tried my old paddock stand (had it 18 years!) and I can't lift the bike up, the pivot point seems all wrong. I was just wondering what others were using with bobbins that they found worked well. I also have an Abba stand now for when I next need to remove my shock for servicing! with hopefully a picture of mine. Abba stand if you don't need to move it around when on the stand. If your flush look at their Skylift ,!! I've got one with the wheels etc and it spins on it's own axis - great bit of kit. Bit pricey with all the bits but well worth it. 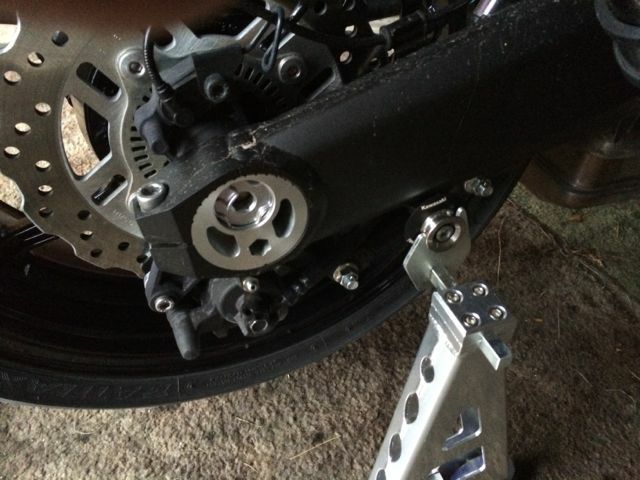 Motogp paddock stand from sportbikeshop is the one I have and works fine on my 18 SX as it did on my 17 ninja 650. I'm sorry for going a bit off-topic... but - why bikes, particularly such large bikes, no longer has a middle stand?